The National Multiple Sclerosis society arranges long-distance bicycling events to raise money and awareness for multiple sclerosis research. On the East Coast, the marquee ride is the MS150 City to Shore, that runs from Cherry Hill, New Jersey (just outside of Philadelphia) to Ocean City, New Jersey. 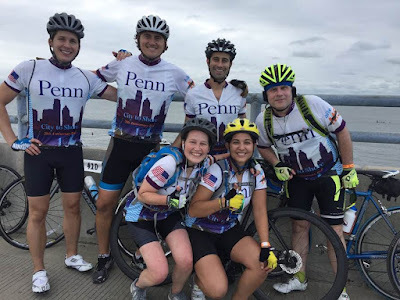 Clyde Markowitz, MD, director of the MS Center at Penn, has long been the driving force for Penn involvement in the MS150. Pictured here are the four residents (Jim, Travis, Laura, and Kelley) who joined Dr. Markowitz and Dr. Eric Williamson on the long ride.